This is a good forest/trail running option, only 4km east of central Zurich, in the hills. 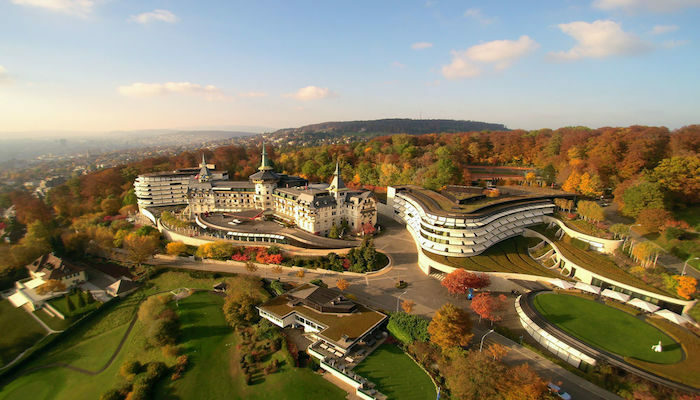 The forest trails are just behind the Dolder Grand, one of the poshest hotels in Zurich, with a renowned spa. Take the 3, 15 or 8 tram to Dolderbahn stop, then take the Dolderbahn up the hill to the end station. From the bahn station, walk up the hill (3 minutes) Dolder Sports (ice skating rink). There is a forest entrance on the right that offers 5k and 8k paths through the woods, well signed.